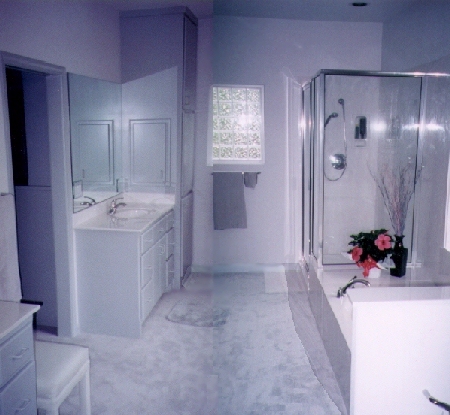 The floor plan on the left was what we almost had for the master bathroom. The advantage was that it put all the "wet" areas in one place. We could then tile that area and use carpet in the rest of the bathroom. The drawback was that we were dividing the bathroom into two small, cramped rooms, instead of having one large, open room. One drawback is that there really is not enough floor space between the tub/shower area and the vanities to have both carpet and a tiled space to step out of the tub/shower and dry off. In our last house (in Houston), the bathroom had about 3 times as much space between the vanities and the shower and tub. I always thought that this was a waste of space, but if I were to do this plan over again, I think that I would add a little more open space between them. Yes, it's a "waste" of space, but on a 3100 sq.ft. house, it doesn't add that much and is "cheap" space. That is, say that your house averages $125 a square foot. That doesn't mean that adding 46 square feet will cost $5000 because $125 is just an average. Adding 46 square feet of space in a kitchen may cost $500/sf or more when you add the cost of cabinetry, granite, etc. Adding 46sf by adding 32" down the middle (horizontally) in the plan above may only cost an additional $1500 or so. The toilet is intentionally near the door and out in the open. In larger bathrooms, most architects put the toilet in a completely enclosed room. To make matters worse, the toilet room door is usually narrower than standard. This would make it very difficult, at best, to get someone from a wheelchair onto the toilet. We are not wheelchair bound at this time, but as retirees, we want to plan for the future. Speaking of toilets, in addition to different styles, you can also choose among the traditional gravity flush or the newer pressure-assisted or pump-assisted flush toilets. Since the law reduced the amount of water toilet makers can design toilets to use to 1.6 gallons, these air-pressure assisted toilets claim to give a stronger flush and to have a larger water surface in the bowl. The air pressure in the pressure-assisted toilet is built up as the toilet's tank fills and helps force the water down more strongly when the toilet is flushed. A pump-assisted toilet uses a electric water pump to do the same thing. We got a Quantum toilet and though it claims to offer a larger water surface in the bowl, it is no larger than any other elongated bowl. Nor is the power flush any more effective at clearing and cleaning the bowl. If anything, it is worse, in our experience. At this point, we would have to say that the extra cost of this toilet was a complete waste of money. Update: After a month, it is getting worse. It takes 3-4 button pushes just to flush the things. Second update: We replaced the Quantum toilets with regular flush toilets. You can buy an already-manufactured jetted tub, with the advantage being that you can choose from many different types of tubs. Craft had our tub custom made out of the same synthetic marble as the shower. The advantage is that everything matches, but the choice of styles is limited. The most disappointing thing in the house turned out to be the jetted tub. Being 6'4" tall, myself, I had specified a tub with 6' of open space in it so that I could stretch out. The opening in tub that was brought out may have been 6' at the top, but it quickly slanted down to only about 3' at the bottom. I cannot even sit upright in it and stretch out my legs, much less lay down and stretch out. When I complained to the tub builder, they claimed that this is the largest tub they could make. At this point, our options were to reject the tub and try to get something else to fit, but which would not match the marble in the rest of the bathroom, or to go with the too-small tub which matched. We finally decided to stay with the too-small tub. (2008 update: I feel like staying with the small tub was a mistake. I wish we had gotten a nice sized Jacuzzi. One feature you can get in ready-made tubs is the use of only heated air in the jets. This can help keep the water warm longer. Another feature is a surface of soft vinyl over foam padding; this also conserves heat as well as being more comfortable. The most sophisticated tubs have computer controlled jet sequencing and different sizes and types of jets for a more thorough massage. Don't do as we did and assume that all marble showers are constructed the same. Meet with the marble sub and make sure you agree on how everything should look, right down to where the soap holder should go. Other decisions we had to make included how high to bring the marble splash guard around the bath tub and whether or not to bring the marble from the shower wall all the way over to the window above the tub. We wanted the glass block window above the tub framed in marble, and the specifics of that had to be worked out. As previously mentioned in another section, even though we had given the marble sub a picture of how we wanted the shower and tub to look, what was done did not match the picture, so it all had to be ripped out and redone. We were basically happy with the re-do, except for the soap and shampoo holder. In the picture (and in every shower we have seen), the soap holder is in the side wall of the shower (opposite the door). In this one, they put it in the wall that the shower head comes out of. This makes some sense in that the water will not hit the soap dish with it in that location, but we don't really like the looks of it. In the picture we gave them, the soap holder was in the side wall. At the very least, the sub should have asked us. But this is a relatively minor item. Something else that got worked out during the re-do was the height of the shower door. In our last house, the shower door did not have a frame across the top for Nelson (6'4") to hit his head on. The marble sub on this house wanted the full frame around the door, but he agreed to make the shower walls and door high enough to provide plenty of head clearance. One final thing was to have a small rectangle of the synthetic marble with a roughened surface outside the shower to step onto. First, the marble contractor ran the marble on the floor longer than he was supposed to, then shorter than it was supposed to be when "correcting" it. Since this was relatively minor and so much had already been re-done, we let it go. We had the shower completely ripped out and the drain pan sunk into the floor so that there is no curb to step over getting into the shower. In fact, a wheel chair could be rolled into the new shower which also has a large bench seat in it. One last lesson we learned about a stand-alone shower at our last house -- it's hard to clean the shower when the only water outlet in it is the shower head. We've seen showers which had an extra water outlet near the floor, but we decided to get a shower head on a flexible hose. The shower walls ended up being about 6'8" feet high. The shower head can be mounted all the way at the top (from which its handle extends the shower head even higher) for Nelson or lower for Kay. This is the first time that Nelson has had a shower head that he could get under without bending, and Nelson strongly recommends this for all tall people. A friend of ours even had a shower-head-on-a-hose put on their jetted tub to make it easier to clean. We didn't think of that in time. We were lucky to have visited the house while the plumbing fixtures were being installed. Otherwise, we would not have been asked about where we wanted the tub faucets to go. In a synthetic marble tub, holes for the handles and spout can go anywhere on the tub (holes are drilled where needed), and the spout does not have to be in the traditional position between the handles. The sub was getting ready to install the handles on the side and the spout nearer the end of the tub. We looked at several different arrangements and decided that the traditional arrangement looked best. If we had not happened along when we did, we would have been stewing over the oddly placed tub fixtures for years to come. 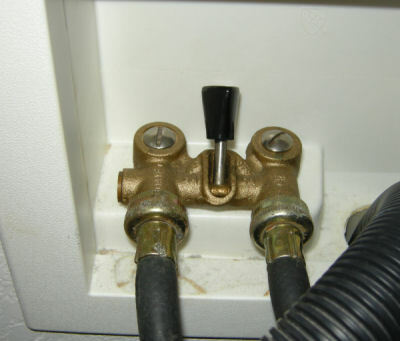 Pictured on the left is a single-lever cut-off for the washing machine. By making it quick and easy to shut off the water, you greatly reduce the risk of having a hose split or other leak in the washer flooding the house. Before starting our house, we had read about "instant-on hot water" and decided to spend a few hundred extra dollars to get it. Instant hot water works by having a "circle" of insulated hot water pipes which run from the water heater to where all the hot water faucets will be, and hot water circulates through these pipes continuously. Each faucet taps into this circle of hot water pipes, so when you turn on a faucet, hot water comes out almost immediately (a little cold water will be in the few feet of pipe between the faucet and the main pipes) rather than having to wait for hot water to come all the way from the water heater. Not only is this a lot more convenient than standing around waiting for water to get hot, it should save money in the long run since all that cold water in the hot water pipes (and probably some hot water too, unless you are standing with your hand under the water waiting for it to get hot) is not just getting dumped down the drain. Also, the circulating hot water pipes have the effect of increasing the capacity of the hot water heater by the amount of water circulating in the pipes. Heated Towel Bar: Next time I would route water from the circulating hot water supply through a heated towel bar in the wall next to the shower. In Judy's house, the water heater, master bath, laundry room, and kitchen are all in close proximity, with only the guest bath being any distance away. So I didn't think that a circulating hot water system was necessary, but Buss decided to add it anyway (for no extra charge). I'm sure that Judy's guests will thank him. The best ceiling-mounted combination light-heater-vent you can buy for a bathroom does not cost all that much money, so this is a good place to splurge. 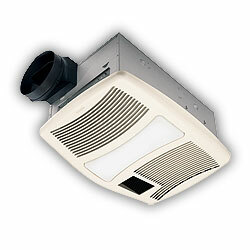 You want the one with the lowest noise rating, greatest air movement rating (for venting out wet air) and good heat output. With a good local source of heat, you can be comfortable in the shower and tub without having to warm up the whole house. We put one unit in the area of the tub, shower and Kay's vanity and another one above the toilet to ventilate that area and to warm up Nelson's vanity. One thing we did not think about was a ceiling fan in the bathroom. This is an unusual feature, but to conserve energy cost, we usually keep our thermostat pretty high in the summer (at 80, most of the time). With ceiling fans in almost every room, we find that this is plenty cool since we usually are just sitting around when we are in the house. The exception is in the bathroom where the shower warms things up. A ceiling fan in there would cool things back down without having to turn down the thermostat. Note that a fan in the bathroom must be moisture-proof or the dampness in the bathroom will corrode the motor and/or ruin the blades (which should be plastic). We purchased over the Internet a ceiling fan with a built-in heater and intended to replace one of our heater-vents with it, but when we got it, read in the manual that it could not be placed in bathrooms. Another new (2007) type of bathroom vent is one which comes on automatically when it starts getting steamed up. You can find one of these at the www.NuTone.com. Most people get glass block windows in their bathrooms. It allows lots of light in without having to worry about window coverings. In Houston, the glass blocks in our bathroom windows were set in mortar, installed by brick masons. Nobody at all seems to want to do glass block in mortar around here. We did some searching on our own after Craft told us this, but we came up empty. This leaves two alternatives: (1) glass block which snaps into a metal framework, or (2) acrylic block which comes from the factory preinstalled in a frame. Acrylic block has better insulation qualities than glass, but we were concerned about how well acrylic block would look in the long run compared to glass. However, the rubber "grout" around the acrylic block looked more like real grout than did the metal frame around the glass block, and our builder promised that the acrylic would hold up in the long run as well as glass. So we went with acrylic. After four years, I can report no problems with the acrylic block windows. In fact, I had not even thought about them until reading this again.